Highlight of the racing weekend is the ARCA Racing Series making its annual visit to Toledo Speedway. The ARCA Truck Series races Saturday, then the Menards 200 runs Sunday. Discount tickets are available at participating Menards stores. I will be at Lake County Speedway for their weekly racing action, but everybody should get out to their local track and enjoy the beautiful weather that appears to have returned to Northeast Ohio. Some things to note…Sandusky has re-scheduled both The Main Event Racing Series and MSA Supermodified races that were supposed to run last week. The Main Event race has been moved to July 11th, while the Supermodifieds have moved to August 15th. The Mansfield Grand Re-Opening scheduled for May 23rd has been postponed. The Main Event Racing Series and MSA Supermodifieds will both announce new dates for Mansfield early next week. I will also be adding Summit Motorsports Park, Thompson Raceway Park, and Championship Kart Racing Association dates to the calendar this weekend. To kick off the 2015 season here at NEO Racing News, I am going to start by looking back at the Top 10 videos of 2014, based on views. As always, remember to check out the more than 300 videos uploaded to the NEO Racing News YouTube Channel by clicking the link! 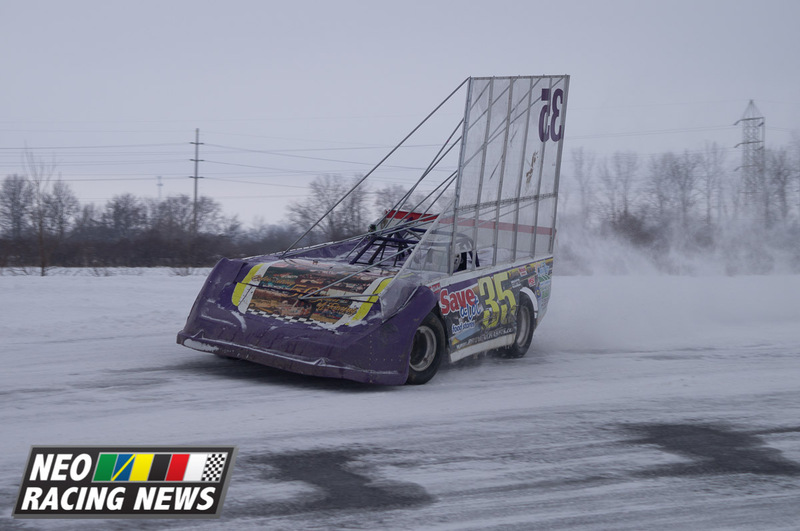 Bring on the snow, bring on the cold, drivers and fans alike were able to cope with conditions for Sandusky Speedway’s annual Wild Bill Hangover Race. 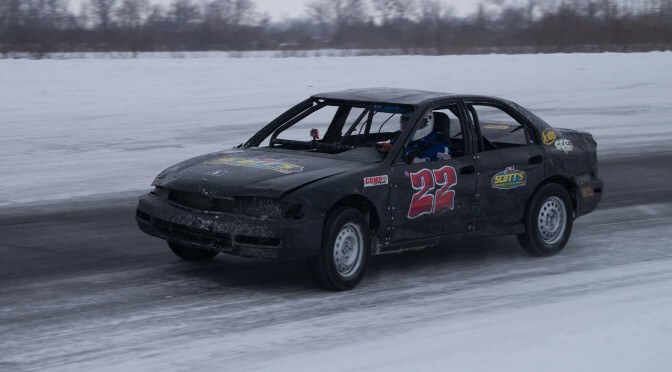 Its unique racing opportunities (as in, they race in any weather conditions) allowed for cars in three divisions to race in snow, slush, and ice. 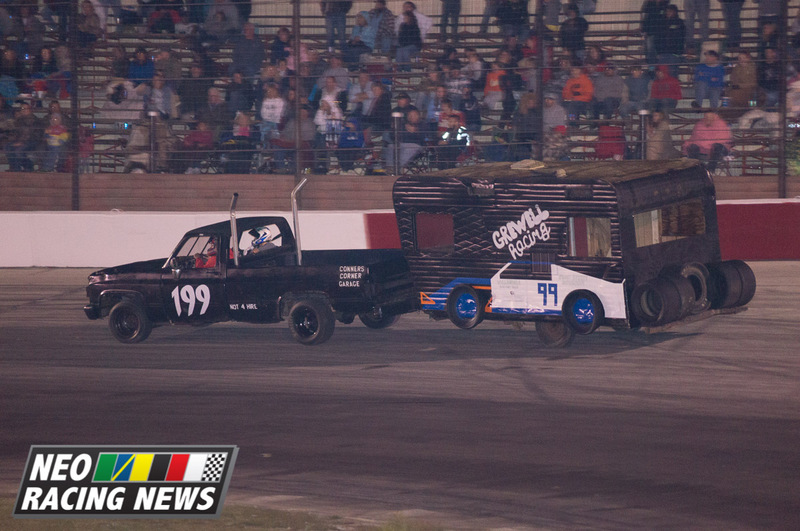 Over 20 trucks and SUV’s showed up with trailers for Midvale Speedway’s Fall Classic Trailer Race. While weather has cancelled racing at a handful of tracks, many others plan to push through the cold and run races. While there is plenty of great racing still on schedule tonight, the highlight is probably Toledo Speedway in Toledo, OH. The ARCA / CRA Super Series and Midwest Tour will both hit the track for the 7-UP 150 tonight at 5 PM. 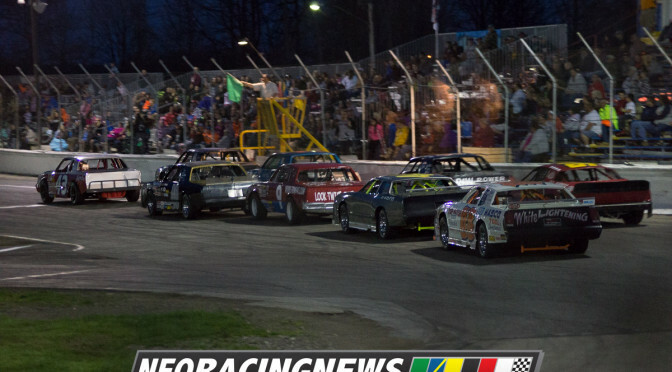 Sharon Speedway features its first Super Late Model Showdown night of the year, while Hilltop Speedway hosts EDGE Modifieds. Also, a pair of FAST series compete at Fremont and Columbus. Drivers battling for the Fremont Attica Sprint Title hit up Fremont Speedway for the first time of 2013, while FAST Series Legend Cars take to Columbus Speedway. Weather was cold and damp enough to cancel racing at Attica Raceway Park last night, and also led to the cancellations of four other races. Midvale Speedway and Lorain County Speedway were both scheduled to start their seasons tonight, but have pushed things back to the 27th now. Eldora and Deerfield also cancelled events due to weather conditions. For a full look at racing across the area, plus known start times and ticket costs, please visit our calendar.